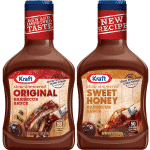 You can load your Kroger card with a free Kraft Barbecue Sauce coupon at Kroger Marketplace. The coupon makes the sauce completely free! This is a pretty cool freebie deal. The Kraft coupon is only available on the website today. The coupon expires by December 21st. You can use this freebie at any Kroger or Kroger affiliated stores.